So that is it from the North West 200. Not exactly the day we had hoped for. There was one exciting Supersport race but we wanted to see more. Thanks for following - and as Arsenal fans say "there is always next year"
Race boss Mervyn Whyte describes the day as disastrous for the North West. "We did our best and people worked hard to get the oil cleared up"
Phillip McCallen on BBC: "The fans are still here and want to see racing. 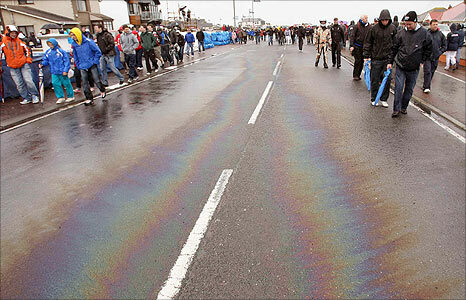 The riders know to be careful on parts of the course which are slippery"
North West Technical Director Mervyn Whyte: "It was a fairly major oil spill from the railway line down to the Juniper chicane. It has taken some time but it has been cleared up. We have to be 100% sure things are OK for racing before we start"
1416: Alastair Seeley says it is too dangerous for racing but Michael Dunlop wants to "have another dart at it"
1355: Technical Director Mervyn Whyte: "There is a lot of surface water on the course. We are going to give it a few minutes and then decide what we are doing"
North West Technical Director Mervyn Whyte on Radio Ulster: "It is very depressing. I feel for the spectators, there are massive crowds on the coast road. A huge amount of work has been put into this event"
1030: It has been announced that the races will be five laps, instead of the planned six. There will be two sighting laps before each event. There will be live video streaming of today's five races - two Superbike, two Supersport 600s and a Superstock. 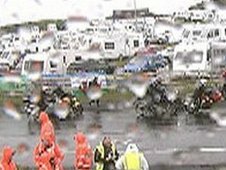 The first Superbike race is scheduled for 1100 but there may be a wet practice before that, giving the competitors a chance to get used to testing conditions. 9.00: Morning all. Well, we had been warned that race day would be a wet one and I am afraid the forecasters were right. It is raining up on the north coast, a grey dull day so far. 21 May 11 | Bikes! 19 May 11 | Bikes! 18 May 11 | Bikes!